Unique paradise property set above parkland protected land, offers expansive, flat, fenced, private, yet full viewing back garden on the mountain. Perfect for croquet, putting green, family ball games, social extravaganzas and quiet reflection. A haven for the birdwatcher, nature lover, photographer, enthusiast. Bear Mountain luxury Westin resort village spread out below offers the full range of tennis, golf, cycling, athletics, swimming, hiking, dining and socialising [www.bearmountain.ca]. Balanced energy flow defines this near 5,000 sqft rock-solid architectural gem and its over 1,500 sqft of viewing decks. A flat entry welcomes your guests to breathtaking views, offering formal dining, reception room, a bistro prep bar, walk-in pantry, chef’s kitchen with stunning views, high vaulted living room and breakfast area, multimedia, gas fireplace, double sets of french doors leading out to the main level dining/view deck. Slate floors anchor the main level. A wraparound front porch offers walk down storage through a secret hatch. Massive cabinets and closets feature throughout the home. Double car garage accommodates workshop, storage, double hot water on demand copper boilers, garden irrigation and illumination controls, security system, centra vac. High efficiency heating, A/C. Top level features the master suite with private view deck, unique stone figure spa w view soaker, private yoga and fitness studio, 2 guest bedrooms w 5 piece bath. Garden level offers a guest bedroom w 5 piece bath, huge library, office and multimedia; double french doors lead out to covered stone view deck, private gardens. A purpose built legal, self sufficient 1 bedroom suite enjoys its own gardens and private entry, parking. Walking path at the end of the cul de sac leads directly down to the Westin Bear Mountain village. To learn more about living at 1200 Natures Gate contact Lewis Ratcliff today. 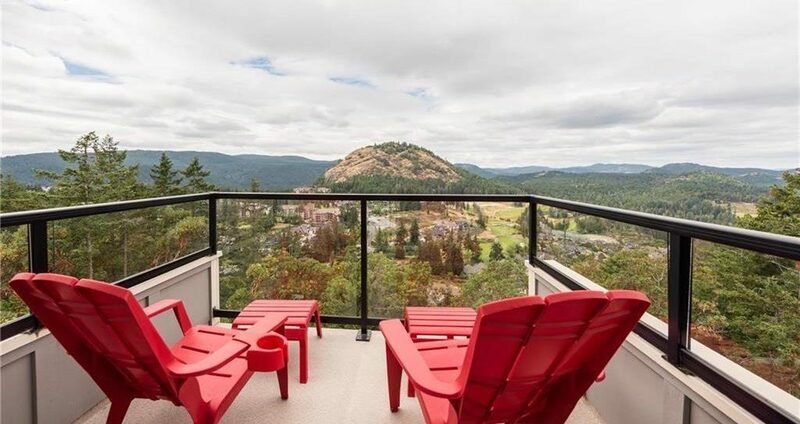 To learn more about living at Bear Mountain click here.